In case you hadn’t heard, Capital One purchased ING Direct from Dutch bank ING about a year ago. And just last month, ING Direct formally became “Capital One 360,” a rebranding of sorts to ditch the ubiquitous orange ball for good old red, white, and blue. Among their offerings, aside from checking and savings accounts, are home loans. That’s right. Capital One is also in the mortgage game, like fellow credit card issuer (and bank) Discover. Of course, they were involved in mortgages leading up to the housing crisis as well, but things didn’t work out too well. Capital One purchased wholesale mortgage lender GreenPoint Mortgage back in December 2006, only to shutter it less than a year later. The defunct company focused on Alt-A and non-conforming mortgages, which quickly led to their downfall. Update: Capital One is no longer offering mortgages of home equity loans/lines as of November 2017. It’s unclear if and when they’ll return to the business. What Does Capital One 360 Home Loans Offer? That was then, and this is now. Capital One 360 Home Loans isn’t nearly as aggressive as GreenPoint, though they do have some jumbo offerings. There are three categories of home loans available via Capital One 360, including fixed mortgages, adjustable-rate mortgages, and home equity lines. Note: They don’t appear to offer government loans, such as hugely popular FHA loans and VA loans. In the fixed-rate department, you can obtain either a 30-year or 15-year loan. The maximum loan-to-value (LTV) appears to be 80%, and the bank highlights the lack of a prepayment penalty. In the adjustable-rate mortgage department, you can go with a 5/1 ARM or a 7/1 ARM, again, at up to 80% LTV. The mortgage caps on ARMs are 5/2/5, meaning the first adjustment cannot move the rate up or down more than 5%, the annual adjustment can only move 2%, and the lifetime adjustment cannot exceed 5%. Pretty standard stuff here, although they lack some popular ARM options, such as the 10/1 ARM, the one-year ARM, and so forth. For home equity lines, the max loan amount is $250,000. The term is 25 years, with a 10-year draw period followed by a 15-year repayment period. Standard. The interest rates on HELOCs are as low as a variable 4% (prime + .75%), and they can be converted to fixed home equity loans free of charge. How Do Capital One Mortgage Rates Look? Speaking of mortgage rates, how does Capital One 360 fare? 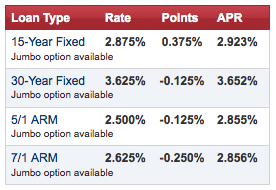 Well, for a traditional, conforming 30-year fixed, their advertised rate as of March 19, 2013 was 3.625% (3.652% APR). They actually give you an eighth of a mortgage point back on the 30-year option. This compares to Wells Fargo’s advertised rate of 3.625% (3.799% APR) on the same day, which requires a 1% loan origination fee. Capital One’s 15-year is offered at 2.875% (2.923% APR) as of March 19, higher than the 2.75% rate over at Wells Fargo, but still cheaper in terms of APR. They also offer conforming jumbo loans, those between $417,001 and $625,000, along with straight up jumbo loans as high as $2.5 million. The rates look pretty competitive on the jumbos, with advertised rates of 3.5% on the 15-year fixed and 3.875% on the 30-year, as of March 19. Capital One 360 Home Loans doesn’t seem to charge much in the closing cost department either. They claim their mortgage closing costs are 41% below the national average for a $200,000 loan cited in Bankrate’s annual survey. It looks like they accomplish this by waiving loan origination fees and points, and keeping junk charges to a minimum. They also offer a free 60-day rate lock to ensure your interest rate won’t change, even if it takes months to actually close your loan. Capital One refers to it as a “rate guarantee,” and essentially locks your rate at the time you accept your mortgage offer. It’s unclear if you can float your rate instead, but I’m assuming you can if you don’t like where rates are when applying. You need to provide a credit card to accept your mortgage offer, and if you back out of the deal after Capital One begins incurring charges to process your mortgage, you’ll be subject to a $450 charge (which is basically the appraisal fee). Capital One estimates that it will take anywhere from 30 to 45 days to close a refinance, and between 45 and 60 days to close a purchase. Not too good if you have a 30-day escrow, so beware. You may want to call ahead. Like other major lenders, you can apply for a mortgage online with Capital One 360 and keep tabs on your loan status via the website. If you’re refinancing, you can close online, and once your loan closes, you can set up an Automatic Payment Plan to have payments regularly deducted from an associated account. They refer to it as the “Pajama Guarantee,” meaning you can do everything from home while sitting in your pajamas, assuming you have an Internet connection (and pajamas). It’ll be interesting to see if Capital One makes a big push in the mortgage space and tries to enter the top 10, or just continues to lay low. I certainly haven’t seen them advertising much. Read more: Mortgage brokers vs. banks. ING Direct was awesome, but leave it to those jerks at Capital One to find another way to insert themselves into people’s lives and screw something up! The orange was fine, but oh no the arrogant types at Capital One just haaaaaad to change the colour so what comes next? Take a look at Capital One’s entire history of acquisitions and just watch them screw up this one. This is the same unscrupulous firm that even used voice modulators for overseas workers to try to fool folks over the phone by masking their accents, but of course that did not work either! I actually think Capital One did a good job processing my loan. I shopped around and found them to have the best combination of rate and fees. And my refinance closed in under 30 days, though it was a pretty straightforward loan. I may go with Capital One since they offer $1,000 off closing costs if I refinance with them. Of course, the interest rate needs to be comparable or better than other banks or it won’t make sense. Still shopping, but they are a contender right now. I’ve been a banking customer since the ING days. since starting the loan process my Good Faith Estimate has been revised twice, with the cost for my rate rising over $2500, I’ve called and they say that its just a glitch and don’t worry about it…. I may have to either eat the $450 fee for canceling the loan, or trying to dispute the charge on my credit card when it hits..
I’m thinking of pulling out my other accounts from them as well. Watch out for the Bait and Switch. I’m beginning to question my decision to use Capital One Home Loans. I went with them for the $1,000 off closing costs, but I think I could have gotten a better deal elsewhere without the sales gimmick. They took 30 minutes to say I was initially approved. It then took 3 months and hundreds of hours and constant reassuring that I would be approved before being rejected. I asked at least four times if we should stop because the process was intolerable. They assured me I was in good standing and they just needed to get the documents. After all that and $500 in expenses, I was turned down. This group is not trustworthy. If you have any other options….TAKE THEM! I loved ING.. customer service and all involved in my re-fi back in 2006. Capital One’s acquisition has made my life horrible. They are not the same company, there are liars, disorganization and rude individuals handling your loan. Stay away … bad business. I have contacted the CFPA and am dealing with disputes, etc. I just realized that a lot of the people on here are either hired from other companies to bad mount capital or something fishy is going on. You can find the exact same reviews in other sites. by different people. seems like other banks are trying to bad mouth other companies. kinda sad. Maybe some disgruntled customers are posting their comments in multiple places for maximum effect. That seems to be the move when people are really upset. As far as competitors bad mouthing companies, I find it unlikely for such a large company to jeopardize their business with bad reviews on my website and others like it. But you never know. I applied for a refinance with Capital One 360 because of the $1000 off and no funds needed at closing but then when I was ready to close they asked for $1200 cash at closing. It’s misleading. Why did they ask for $1,200 at closing? Bought a new house in Sept 2015, (it was built for me from scratch), got their 15 year ARM. In Jan, got a notice that my escrow account was too low, and that they paid over 7K in county taxes. Taxes should be around $2500. Tax authority sent the money back. After days and hours on the phone, they told me that they outsourced the escrow to CoreLogic, who determined that the tax liability was over 7K. The land was part of a bigger piece before the builder bought it, sliced it up and started building houses, hence the discrepancy. But it took months for them to fix it. They gave me a false 2015 1098, messing up my taxes. I told them to issue me a new one, and they said no, the 2016 will show a refund of 7K (making whatever I pay in 2016 not deductible..) so it effectively screwed up my income taxes for 2 years. I asked for a copy of the recordings of our phone conversations, they said no: those are ‘privileged.’ Customer service is legalistic and hapless from the bottom up, wasted hours of my time, and just kept blaming CoreLogic, but would not provide me with any means to contact CoreLogic. I also asked to be exempt from escrow, as I only owe about $110K on a 300K house (the original loan was for about 150K. They said no, because I haven’t had the account for a full year, never mind the 800 credit score, less than 50% LTV, and 100K income… I went with these guys b/c they were cheap, and it has cost me more time and stress than it saved me in $. Sounds truly awful, sorry you’re dealing with that.